Trossard on his way to Arsenal? Arsenal have deployed scouts to monitor the progress of Belgian whizzkid Leandro Trossard. The winger, who is highly rated in his homeland, has caught the attention of numerous Premier League teams, but it is believed Arsenal are in pole position to secure Trossard's signature. Unai Emery has deployed his chief scout to watch the Genk winger in action and has received glowing reports back regarding Trossard's progress. The 5 foot 7 midfielder, who is comfortable playing in attack too, is yet another hot prospect off of the Belgian footballing production line. 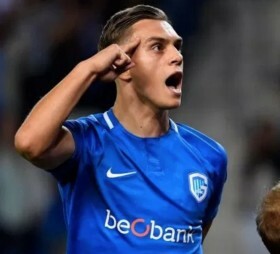 The 24-year-old, who has played for Lemmel, Westerlo and Leuven on loan prior to returning to his home club Genk, has caught the eye in the Jupiler League this campaign and is reportedly now valued by his club at around 15 million euros. Arsenal are likely to make a move for a host of new players in the summer with the likely departure of Aaron Ramsey and Mesut Ozil and the funds from Ozil's departure will be used on Trossard. Trossard, who has played at every youth level for Belgium, has also been monitored by Man Utd and West Ham.